Is there a better alternative to iWinSoft Barcode Maker? Is iWinSoft Barcode Maker really the best app in Applications category? Will iWinSoft Barcode Maker work good on macOS 10.13.4? 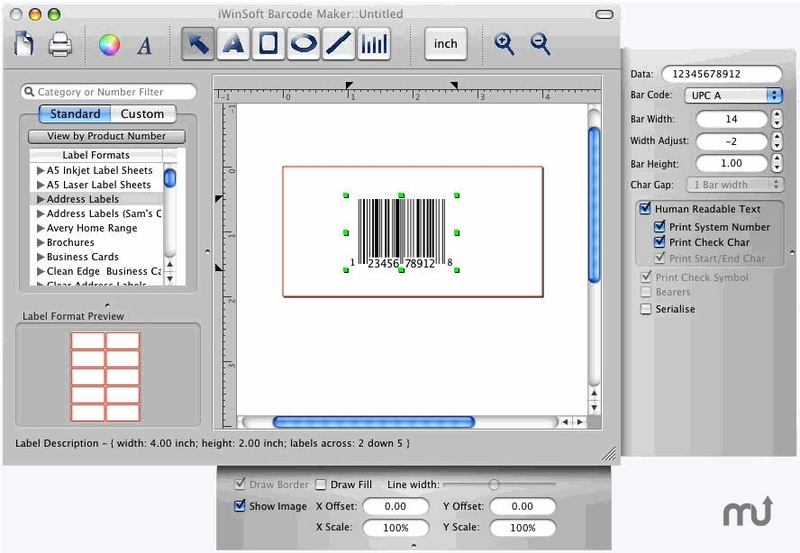 iWinSoft Barcode Maker is professional barcode label software for OS X which can create, export, and print barcode labels. It supports industry standards like ISBN, ISSN, EAN, UPC, I2of5 (Interleaved 2 of 5), Code 39, Code 11, Code 93, Code 128, EAN-13, UPC-A, UPC-E, EAN 8, ITF 14 (EAN/ITF 14), Codabar, DataMatrix, Intelligent Mail, MSI, Japanpost customer barcode, Postnet, FIM Codes (3 types), Horizontal bars, and more! Sequential barcodes from text file functionality improved. Copy barcode objects to external clipboard fixed. Datamatrix, Intelligent Mail and Pharmacode barcodes added. Code 128 sequential printing fixed. iWinSoft Barcode Maker needs a rating. Be the first to rate this app and get the discussion started! It supports generation of sequence barcodes. Importing barcode data from a text file to batch-create barcodes is also supported. Make multiple barcodes automatically with only a few button clicks. Print all of your labels on popular label stock from Avery, A-One, and many other U.S., European, and Asian manufacturers. iWinSoft Barcode Maker makes it easy to copy and paste generated barcode, into other software applications, or export barcode as EPS, TIFF, PNG, JPG, BMP, SVG,or as a PDF file.